We recently completed a project for the City of Melbourne to provide an improved understanding of current trends in transport emissions. We aligned their method of calculating emissions with international (GPC) protocols. This project also provided a set of recommendations designed to bring the City of Melbourne’s transport emissions in line with climate change commitments. The evidence reviewed for this report shows that current transport emissions exceed the levels required to meet Australia’s obligations under the Paris Climate Change Agreement. These emissions are forecast to increase under the existing policy context. Sustained and unprecedented action will be required to arrest and then reverse this trend. The Australian Government has set the target of reducing emissions by 26 – 28% below 2005 levels by 2030. In reality, this will require per capita reductions of around 50%, given population projections. The Australian motor vehicle fleet has shown only modest fuel efficiency improvements over the last 40 years, from around 12 litres per 100km to around 10 litres per 100km. The infographic below illustrates the stark contrast between dirty and clean transport modes and the space each mode consumes. 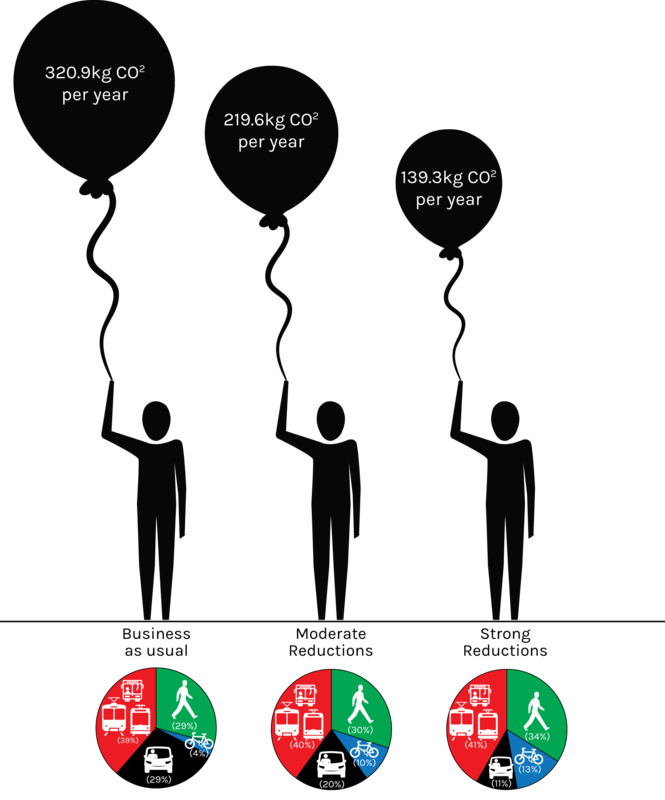 This figure uses black balloons to illustrate the emissions, on a per person, per kilometre basis. One unexpected finding from this investigation is that due to the carbon intensity of Victorian grid electricity, an electric car can actually be more polluting than new petrol cars. 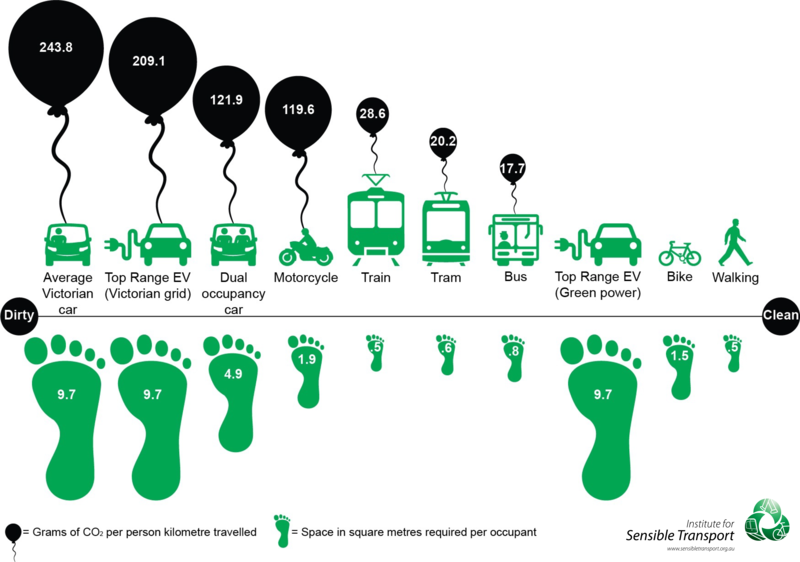 The space consumption (shown as footprints in the above image) from different modes illustrates that cars are the most space consuming mode of transport, on a square metres per person basis. Electric cars, unsurprisingly, are just as problematic as petrol cars in this respect. This report has found that the dirtiest, and least space efficient modes of transport continue to receive the largest allocation of road space. The City of Melbourne’s street network continues to reflect priorities from earlier generations. Of the three scenarios, only strong change provides the level of CO2 emission reduction necessary to meet the Paris Agreement. The three scenarios can also be expressed in terms of per person emissions and mode share, as shown in the figure below. This figure compares the projected per capita GHG emissions and transport mode share in 2037. To achieve the outcomes modelled in the strong emissions reduction scenario, substantial changes in road space allocation, towards more space and emissions efficient modes are necessary. The mode shift changes necessary in this scenario require a transformation in road space allocation, to provide the priority for walking, cycling and public transport to encourage a substantial increase in the use of these modes. As identified by the IPCC, it is clear that ‘aggressive and sustained’ mitigation options will be required for the City of Melbourne to have a reasonable chance of meeting its emission reduction targets. 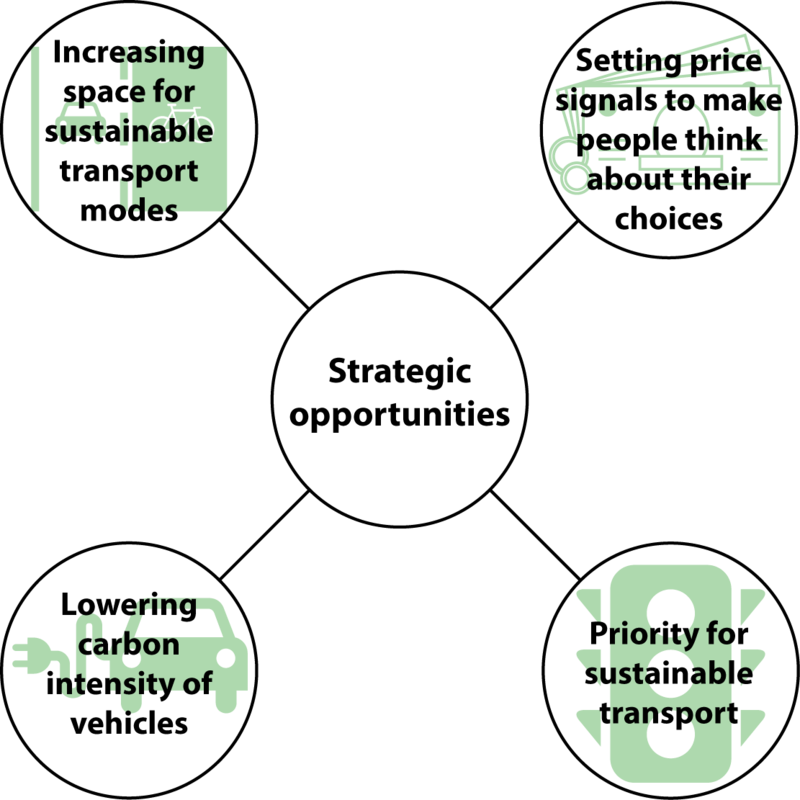 There are four main ways that transport related GHG emissions can be lowered, as shown in the figure below. The following set of options were recommended in order to bring the City of Melbourne’s emissions down to levels consistent with the Paris Agreement. Current road space allocation in the City of Melbourne is a legacy of car orientated planning which emerged from the post-war boom. There is significant scope to reallocate road space to focus on creating more conducive conditions for walking, cycling, and public transport. Reallocating road space towards walking, cycling and public transport will achieve the twin goals of lowering GHG emissions from transport and enhance central Melbourne’s role as the economic and cultural hub of Victoria. By converting motor vehicle travel lanes or parking bays towards enhanced conditions for sustainable transport (e.g. priority bus lanes, wider footpaths, protected bicycle infrastructure), greater numbers of people will be able to access the city centre, whilst at the same time emitting less carbon. Although there will always be a need for the parking of motor vehicles, including deliveries and other commercial activities, current levels of car parking are higher than optimal. There are several important reasons intersections are vital opportunities in which to implement sustainable transport initiatives. Firstly, intersections have a disproportionate number of crashes, and in the City of Melbourne, many of these crashes involve pedestrians and cyclists (City of Melbourne, 2014a; VicRoads, 2017). Secondly, intersections are a cause of delay, and given the importance of travel time to transport mode choice, intersections offer an excellent opportunity to reduce travel delay for the modes an authority seeks to enhance. This approach will complement road space allocation initiatives that also prioritise walking, cycling and public transport. Cycling can also be further encouraged through the implementation of a green wave program. A number of cities have implemented this in recent years, in which the light sequences are timed to allow a cyclist travelling at average speed to have a constant set of green lights. The St Kilda Road corridor is the obvious place to trial such an initiative. Improving the efficiency of the vehicle fleet is required as part of the overall effort of reducing transport related GHG emissions. This is also an area where the City of Melbourne has relatively little power to affect change. Emission standards are set at a Commonwealth level and cars move freely across jurisdictional borders. Recent trends have seen only minor improvements in fuel efficiency, and fleet age is still at an average age of 10 years. Electric vehicle sales in Australia are low by international standards, with a lack of policy support being a factor, according to the Chief Scientist. For EVs to make large scale decreases in emissions, it is of critical importance that they be charged from renewable energy. As discussed in Section 3.2.1 of the full report, the Victorian electricity grid is very emissions intensive by international standards. Charging EVs with the average mix of Victorian electricity is almost as polluting as the average Victorian car, and more polluting than a modern petrol-electric hybrid or diesel car. However, if coupled with initiatives to green the electricity grid, EVs have a huge potential to cause marked reductions in GHG emissions.